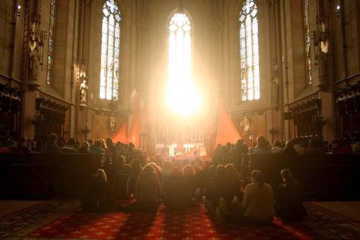 I heard about Taizé many years ago. My sisters attended the European meetings a few times, but I had never been interested in it until my Erasmus stay in Paris. I felt a bit lost in Paris – I didn’t know anyone there and at the beginning I hardly spoke French. Once I was walked around near the church of Saint-Germain-des-Prés and suddenly I met a community of young people who were very welcoming and with whom I lost my distress while repeating words of the beautiful Taizé songs. I didn’t even need to speak French to be able to sing with them. One month later there were the All Saints holidays and I went to Taizé with those young people from Saint-Germain-des-Prés. Again I was touched by the songs and silence on the one hand and by the community and fellowship on the other. It seemed to me that that seeking for truth and for sense in life is compatible with having fun and friends. So I returned to Taizé with a friend of mine few months later. We missed the bus from Prague and therefore had to hitchhike the whole way – more than 1000 km. It was worth it. We spent half of the week in silence – a new and very enriching experience. Once again I decided to return – this time with a little microbus and car full of my friends for the Easter celebration. 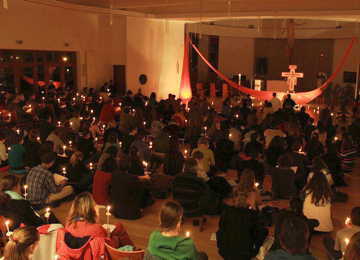 For some reason I felt an urgent need to show Taizé to others, hoping that they will find there the same calming and charging atmosphere like me. Half a year later I attended a “day of trust” in Olomouc and another half a year later one of the brothers visited Prague and we spoke about the possibility of preparing a “Vigil of Trust” also in Prague. By that time it seemed to me already quite natural that I would help. It was more a decision of the heart than of the mind. On one hand I was a little bit afraid to make a commitment to organize anything – like many young people I’m afraid of commitments. Will I have time ? Will I have the strength for it ? What if I have school or what if there is some other program that I would prefer to the “Vigil of Trust” ? But I guess when one makes some decision and puts it as a priority, it’s easier to find the time for it. And when it’s a good and meaningful thing, it usually somehow works out, one just needs… trust! And so it did work out. Even though I had a state exam two days before the “Vigil of Trust”, even if other members of our team were also very busy by that time – with school, work or other activities. The beautiful evening with the Celebration of Light which was attended by 350 people was a big satisfaction and confirmation that the effort made sense. Also the Bible introduction in the afternoon and the meetings in the small groups were very enriching. How did the preparation work? We decided to split into smaller teams that were each responsible for a certain thing – music, decoration, information, webpage, food etc. I was responsible for the informing people of the event, including the contact with media. So I urged people to post the beautiful posters in their parishes, schools.... I also contacted various Christian and secular media, sent them invitations and press releases before and after the event. I made little interviews for some media and arranged bigger interviews with the brother who visited us in Prague. It was nice to see at the end how all the teams put their work together and the little parts formed the beautiful “Vigil of Trust”. And since all of us volunteers were young people, it was also fun to cooperate with each other.